French Diploma D.E. 2011, canyon qualification B.E. level 1995. Alain has years of canyon guiding experience. He did the first descent of Robinson and Wilson Creeks. 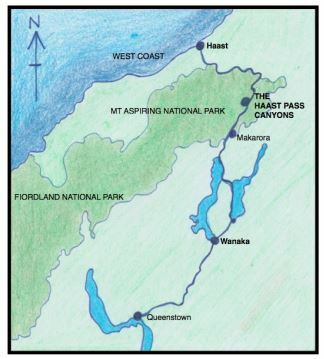 Many other first descents in New Zealand. He has descended extensively many of the classic canyons of France (including Reunion Island), Spain, Italy and Switzerland. Alain is also a fully qualified trekking guide, rock climbing and caving educator, and has qualifications in canoe-kayak, rafting and swimming in wild water. Annette is a kiwi and has been canyon guiding since 2005. She is passionate about the canyons of the Wanaka and Mt Aspiring region and has been part of many first descents in both this area and other locations about New Zealand.